Posted on December 14, 2018 at 5:42 am. We’ve got spirit, yes we do, we’ve got spirit, how about YOU!! The Williamsburg SCA is PUMPED to announce our Winter Break SPIRIT WEEK!! 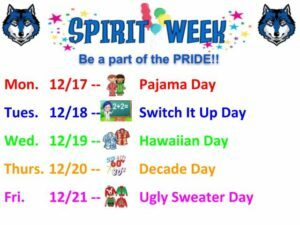 That’s right, every day next week, students and staff are encouraged get into the SPIRIT and dress-up with the daily theme. Here’s the rundown: on Monday, roll out of bed for Pajama Day. Then Tuesday is Switch It Up Day — students dress like teachers, teachers dress like students. On Wednesday, wear your best flowered shirt or Hawaiian Day. Thursday will be a blast-from-the-past with Decade Day. And finally, Friday is our favorite holiday tradition: UGLY SWEATER DAY!! So get into the school spirit, wolves, and BE A PART OF THE PRIDE!! It’s the most wonderful time of the year… for you to RETURN YOUR LIBRARY BOOKS!! TA Teachers will be handing out overdue notices this morning. Students are requested to PLEASE bring those books back to the library before you head off for Winter Break. See the school librarians with any questions. Calling all actors, singers, and technicians! Auditions for the WMS Spring Musical — Disney’s “Alice in Wonderland, Jr.” — will take place in the auditorium on MONDAY during ASP 1 only. Interested performers should prepare three things — the song “Happy Birthday”, a short nursery rhyme, and another song of YOUR CHOICE that highlights YOUR VOICE. See Mr. Brown with any questions. Break a leg! Calling all members of the WMS Girls Soccer Team! This is a reminder that your end-of-the-year PARTY will be held on MONDAY after school in room C102. Be sure to bring your CLEANED uniform to return. See Mr. Girard with any questions. The WMS Symphony Club will be meeting on MONDAY during ASP 1 and 2 in the Band Room. All musicians are invited to by and celebrate our upcoming winter break with some beautiful music! See Ms. Tuttle with any questions. And finally today: Hang your canvas and mix your paints! It’s time for “The Artist” with student-reporter Allison K!